If existing window is fitted with aluminum tracks, remove securing staples, and remove both sashes and tracks. Locate the pre-drilled screw holes on the sides of window frame. For Mechanical and Welded series, holes will be located at the top and bottom of both frames sides, under the window stops. (Oversize windows may also have pre-drilled holes in frame top) For sliders, casement, and oversize windows, remove factory installed screw caps from top and sides. If installing a head expander raise expander until it is flush with top of opening. Drill pilot holes and secure to frame with small screws at lowest part of expander. 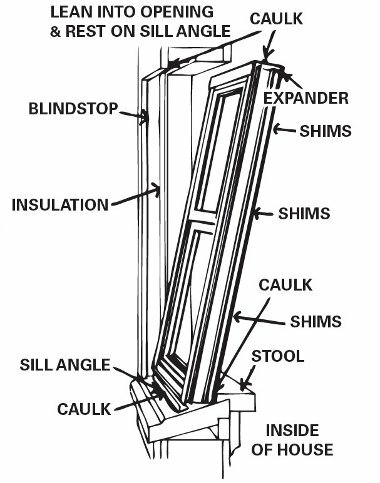 For more instructions, see our page on measuring a window for replacement. * Please note every installation is different. These are just basic suggestions and the installation varies per job and based on the installer. Contractors need to check with the town and/or county to make sure they meet codes and requirements versus our suggested install. Lang is not responsible for any such issues whatsoever.